As Georgina discussed, web content curation is nothing new, although if you go by the current frenzy surrounding the concept you’d think it was. Many sites, like BoingBoing and Arts & Letters Daily, for example, have been lovingly hand-picking content and serving it to audiences with specific interests or tastes for years. What is new, however, is that there are a growing number of tools that allow you to do your own curation, in your own image, for your own purposes. How can curation help keep your remote team on the same page? In a nutshell, curation is selecting content from the web, based on specific criteria and presenting it to an internal or external audience, or both. With aggregation, the precursor to curation, we generally selected content for our personal consumption and had little filtering control. We usually had to be satisfied with receiving all content from a given source (the entire RSS feed of a site, for instance) without being able to filter out content we didn’t want. 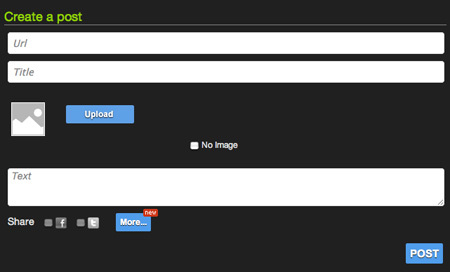 With curation, you choose specific items to share from a source and have the option to add your own editorial comments. If you’ve ever tweeted a link or retweeted someone else’s tweet, you’ve curated content. Did you see that thing I tweeted? It can be frustrating to try to get information you want to share to everybody on your team who could benefit from it. You all need to be up to speed on your market, competition, technology, trends, etc. If you’re sharing this info in a haphazard way (using multiple communication channels, crossing your fingers that team members will see and act on the info, mixing items of personal and professional interest), then having a system for content curation might be for you. Curation platforms are still in their infancy; no single tool is likely to be the perfect solution for your needs. You’ll have to explore the various platforms and keep an eye on the evolution of the trend if it interests you. Be on the lookout for curation features to start being integrated into collaborative project management platforms. In fact, Producteev, a task management app that we’ve covered before, will soon allow team members to curate content and attach it to specific projects and tasks. Fortunately for you, Pierre Tran, a French tech journalist, recently carried out an extensive comparison of a number of curation platforms, and prepared a very useful table in English and French that you can use to start exploring. The platforms in Tran’s table offer a range of output options (the format in which people will be able to consume your curated content) from RSS feeds to embeddable widgets to stand-alone web pages. Their intended use ranges from collection of business intelligence (BI) for a company’s or team’s internal use (Eqentia, Knowledge Plaza, Factiva) to collecting and sharing interesting images or multimedia (Fancy, Pinterest, Magnify). Depending on what it is you do, the BI platforms might meet the needs of your team but, then again, if your team is composed of graphic artists, the “pretty picture” type of platform might come in handy as a group inspiration board. You also need to decide if you want to curate exclusively for your team, or if you also want clients or the public to have access to the results of your curation efforts. Most curation platforms are designed for sharing the content with a public audience (Pearltrees, PublishThis), which your team could also access, of course. The only curation platform I’ve spent any time with is Scoop.it. It allows you to create a standalone page that resembles a blog and features content you have selected from the sources Scoop.it has helped you gather. There’s also a bookmarklet you can use to scoop up content you see when you’re out and about on the web. 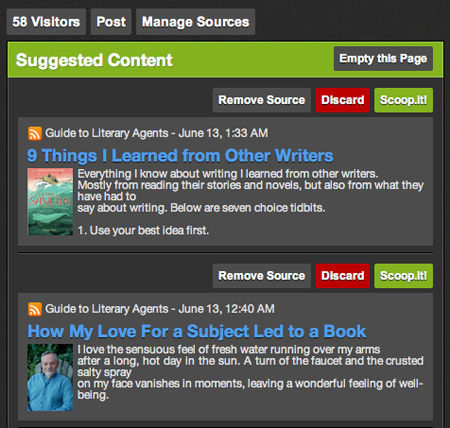 Your team (and your clients, and the public) can subscribe to the RSS feed of your Scoop.it page. In the near future, you’ll have the option to keep your Scoop.it page private if you prefer to use it for your team only. Here’s an example of a Scoop.it page. You start by entering keywords for your topic, and Scoop.it automatically pulls content from a number of major web and social media sources (you can delete those you don’t want). 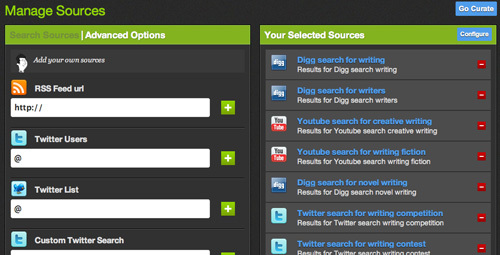 You can then add your own sources, like specialized blogs, individual Twitter accounts, and more. For each piece of content, you can add your own comments, which is very useful if you want to point out to your team why you selected an item and what you want them to get out of it. You can also create posts from scratch. The sites that have been curating since before everybody was calling it that use tools that were already out there to get the job done. If none of the ready-made platforms work for you, don’t forget that you can, for example, create RSS feeds based on keywords in Google Blog and News search (s goog), and from there curate and furnish your selected content manually in a number of ways. The idea of curation isn’t to steal other people’s content in its entirety and use their work to draw traffic to your site. That would be unethical and illegal, even if you credited them. If you’re sharing your curated content with the public, you need to be sure that what you share with the public falls within the bounds of fair use and link to the complete, original content at its source. If you read French, I highly recommend Pierre Tran’s companion article to the table he created on curation platforms (Le Guide de la curation (3) – les outils), and another table he created on automated publishing platforms (those with no manual filtering) in English and French. If you’re already curating for your team, please let us know about your tools and workflow in the comments. Great insight, Pamela. You may also want to check out Curata (www.getcurata.com), the content curation tool that my company, HiveFire, Inc., offers. Our clients are using it for the internal, information-sharing you discuss, as well as for marketing purposes, like boosting SEO, establishing thought leadership and engaging customers and prospects. Good article, and thanks for bringing up this important topic. Aggregation can be coupled with filtering, and when combined with curation controls and various publishing choices, it’s a powerful combination. Reality is that there’s a bit of excessive hype right now pertaining to curation, and it’s starting to lose a some of its meaning. Reading what’s in your social stream or other streams is not curation. It’s information discovery. We’re being distracted by that, and we have no more time to apply proper filters that matter to us. People-filters are not enough. Also, keep in mind that consumer oriented solutions and needs will vary drastically from those aimed at the professional user segment. Curation platforms must offer productivity gains to the curators. Excellent article, Pamela. You should also check out StoryCrawler for content curation. It’s a cloud-based service that offers the highest quality content and easy republication across multiple Internet and mobile platforms. Hi Meredith. StoryCrawler also looks like a good tool. Thanks for letting us know about it! Great article Pamela. I’m curious do you use Scoop.it for personal use or as a utility for gathering content around stories? Hi Scott. I’m using it for fun under a pseudonym to curate articles and news related to a niche art form. For keeping tabs on Internet trends and tech I use Twitter primarily and RSS (less since Twitter came along). Thanks for recommending my tables and article! Lovely work Pierre. I’m thinking of translating the 3 Guides. Thanks for doing all that great research! Excelllent article. Brilliant insight and great wording! I’ve found out that simply curating something to a website is not enough to build some kind of engagement within your team. Our communication tool Flowdock (http://www.flowdock.com/) does a good job aggregating everything that’s somehow relevant to your team, and then bringing it in the middle of real-time discussions. For example, our team follows what’s happening in wikis, project management tools, version control systems, on Twitter, anyone linking to our website etc. Then when something interesting happens, it’s very natural to start a discussion about it, in the same tool. Hi Otto, looks like a very nice tool! Thanks for bringing it to our attention.